"Everything I know about life, I learned from The Andy Griffith Show," says Joey Fann, author of The Way Back to Mayberry and founder of BarneyFife.com. Millions would agree. Many factors contribute to the continued worldwide success of the television classic that made a smalltown sheriff, his son Opie, Aunt Bea, and a comedic deputy famous. Fans know the most important element of this popularity is the program's emphasis on basic moral principles; almost every episode provides a lesson, a good example, or helpful word. 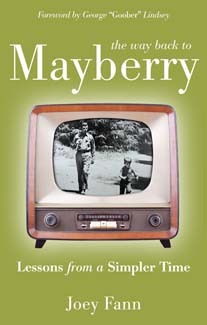 Coinciding with the 50th anniversary of The Andy Griffith Show, this new edition of The Way Back to Mayberry draws out the subtle parables found in thirty favorite episodes, including "Opie's Charity," "Man in a Hurry," "Andy on Trial," "Barney and the Choir," "Deputy Otis," "The Jinx," "Sermon for Today," and "Christmas Story." Also includes 32 black & white photographs. Joey Fann began teaching classes based on the values and ideals depicted in The Andy Griffith Show in 1998. Since that time his material has received media attention from The Washington Post, USA Weekend, People magazine, and various television networks. Joey currently works as a software engineer in Huntsville, Alabama, where he lives with his wife and daughter.